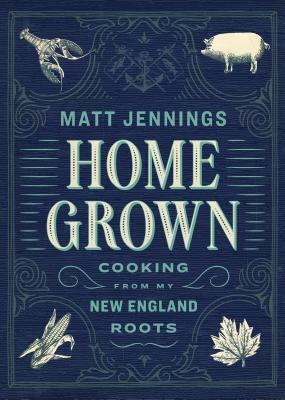 In his debut cookbook, chef Matt Jennings honors the iconic foods of his heritage and celebrates the fresh ingredients that have come to define his renowned, inventive approach to cooking. With four James Beard Award nominations for Best Chef: Northeast, three Cochon 555 wins, and a spot on Food & Wine’s 40 Big Food Thinkers 40 and Under list, Jennings is a culinary innovator known for his unexpected uses of traditional northern ingredients (maple syrup glazes a roasted duck; a molasses and cider barbecue sauce makes the perfect accompaniment to grilled chicken wings; carbonara takes on a northern slant with the addition of razor clams). With over 100 vibrant, ingredient-driven recipes—including modern spins on New England staples like clam chowder, brown bread, and Boston cream whoopie pies, as well as beloved dishes from Jennings’s award-winning restaurant, Townsman—Homegrown shines a spotlight on a trailblazing chef and pays homage to America’s oldest cuisine. With four James Beard Foundation Award nominations for Best Chef: Northeast, three Cochon 555 wins, and a spot on Food & Wine’s 40 Under 40 Big Thinkers in America list, chef Matt Jennings is recognized nationally for his bold, lusty cooking, and his dedication to New England artisan and seasonal ingredients. After a decade of success with his restaurant Farmstead in Providence, Jennings returned to his native city of Boston in February 2015 to open Townsman, a New England brasserie that pays homage to his deep roots in the area, showcasing his commitment to locality and love of the Northeast. Townsman was named one of Esquire’s Best New Restaurants in America; USA Today named it one of the 10 Best New Restaurants in the country; and Food & Wine included Townsman in their list of 10 Restaurants of the Year. Find Jennings on Instagram @matthewjennings and online at townsmanboston.com.